This Muslim Girl Bakes: A Snowy Friday. This was from last night's dinner but I had some of the leftovers for breakfast (topped with an egg) today. It's a shepherds pie filled with cinnamon and pomegranate molasses lamb mince. We topped it with a swede mash. I wasn't too sure about the swede but it ended up being really lovely. Anyway, on to this morning. We woke up to snow! PS. Thank you so much to all those on snapchat (username is muslimgirlbakes) who have been so lovely about our garden. My dad assembled the shed at the back a few weeks ago and we're all very pleased that it survived its first snow storm. As the snow fell, I prepared ingredients for todays recipe shoot. I have loads of new recipes ready to share with you all next week! Sneak peeks here, here and here! Today, I shot a recipe for cranberry rolls. This was the cranberry filling which I flavoured with two of my favourites - cinnamon and cardamom. By now, the snow had gotten much thicker. These conifers are in a neighbours garden. They're getting quite tall and beginning to block the view of my precious hills. Today, they came into their own though. Aren't they beautiful when covered in snow? The weather got colder and my baking continued. The filling bubbled together before cooling. Then, it was time to roll! I think the cranberry is my new favourite fruit. Whilst the rolls rose (try saying that five times over! ), we had lunch. We're big fans of cheese in this house and tried a few new ones today. This one was a Wensleydale with cranberries. This was a Blue Stilton and I was not a fan! This was a Red Leicester which has always been one of my favourites. Finally, the classic mature Cheddar. The crackers were these ones, the chutneys were this one and this one, and for fruit, we had pears, apples and tangerines. And with that, the rain started which began to melt the snow. Sad times! Made much better by glazing our rolls in a spiced orange glaze. The recipe will be on its way to you very soon! 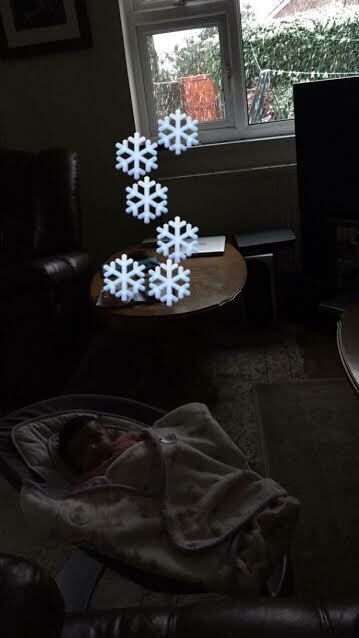 I love this picture my cousin sent me today of my favourite person enjoying her first snowfall. Hope you had the best Friday! Have a lovely weekend!